Gebirgsjäger (German pronunciation: [ɡəˈbɪʁksˌjɛːɡɐ]) are the light infantry part of the alpine or mountain troops (Gebirgstruppe) of Germany and Austria. The word Jäger (meaning "hunter" or "huntsman") is a characteristic term used for light-infantry or light-infantryman in a continental European military context. The mountain infantry of Austria have their roots in the three Landesschützen regiments of the Austro-Hungarian Empire. The mountain infantry of Germany carry on certain traditions of the Alpenkorps (Alpine corps) of World War I. Both countries' mountain infantry share the Edelweiß insignia. It was established in 1907 as a symbol of the Austro-Hungarian Landesschützen regiments by Emperor Franz Joseph I. These troops wore their edelweiss on the collar of their uniforms. When the Alpenkorps came to aid the Landesschützen in defending Austria-Hungary's southern frontier against the Italian attack in May 1915, the grateful Landesschützen honoured the men of the Alpenkorps by awarding them their own insignia: the edelweiss. Together with the Fallschirmjäger (Paratroopers) they are perceived as the elite infantry units of the German Army. Honouring tradition, upon the creation of the Bundeswehr in 1956, the mountain infantry returned as a distinctive arm of the West German army. Until 2001, they were organized as the 1. Gebirgsdivision, but this division was disbanded in a general reform. The successor unit is Gebirgsjägerbrigade 23 which has its headquarters in Bad Reichenhall. The battalions of these mountain infantry are deployed in southern Bavaria as this is the only high mountain area in Germany touching the Northern Alps. Since 2008 the unit is officially called "Gebirgsjägerbrigade 23 Bayern (Bavaria)" as a commendation of the close relationship between the state and the Gebirgsjäger. According to the official Bundeswehr website, the brigade has a current strength of 6,500 soldiers. The soldiers of the mountain infantry wear a grey cap (Bergmütze) with an edelweiß on its left side, stem to the front. This distinguishes them from all other German army soldiers who wear berets and the Austrian army, whose edelweiß has its stem to the back. The formal uniform, which is based on traditional alpine mountain climbing trekking outfits (Berganzug), is also different from the standard mainstream German army uniform, and consists of a light-weight grey ski blouse (Skibluse), black Stirrup trousers (Keilhose) or especially during the summer periods "Culottes" knee-breeches (kniebundhose) similar to knickerbockers, and ankle-height mountaineering boots (Bergstiefel) or dual-use mountaineering ski boots. A soldier is allowed to wear the edelweiß on the forage cap after he has completed the "Edelweißmarsch". This honor is only allowed for the mountain infantry. German Gebirgsjäger traditionally share a very close comradeship and distinct esprit de corps. There is also a special perception of discipline which can for example be seen in a relatively informal relationship between officers and soldiers during normal day duty. Gebirgsmusikkorps (Mountain troops military band) in Garmisch-Partenkirchen. The Gebirgsmusikkorps is one of the most popular military bands in Germany. It performed for the ISAF in Kabul, Afghanistan in 2002. As the Gebirgsjägerbrigade 23 is part of the so-called stabilisation forces (Stabilisierungskräfte), it lacks any accompanying artillery. Mortar support is provided by the Schwere Jägerkompanie (heavy infantry company) in every mountain infantry battalion. A mountain infantry battalion consists of about 900 soldiers in five companies. One company is responsible for staff and support duties and has a "Hochgebirgsjägerzug" (special platoon for high mountain fight and reconnaissance) at its disposal. Three companies are consisting of classical mountain infantry, another one is a heavy company which is equipped with the Wiesel AWC for mortar support, tank defence and supporting cannon fire with 20 mm guns. 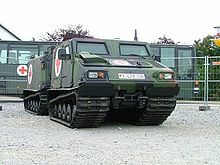 Two of the three mountain infantry battalions are equipped with the Hägglund 206S, one with the GTK Boxer. Also see Alpenkorps for the World War I era unit. This page was last edited on 22 February 2019, at 14:11 (UTC).